FREE FREIGHT - NO TAX - CLICK HERE TO SAVE! FREE FREIGHT - NO TAX - Laptop Car Table CLICK HERE TO SAVE! FREE FREIGHT - NO TAX Van Laptop Table CLICK HERE TO SAVE! Combined with your laptop table, you can add laptop table accessories to complete the mobile office in your car, truck, SUV or van. These accessories include, screen holders, side tables for printers or writing tables, cell phone holders, PDA holders, night lights and other add-ons. In addition a complete line of Kodiak Docking Stations are available for the discriminating professionals. Our Emergency Services Radio and Equipment Consoles improve access to communication equipment and other controls, while promoting safety by allowing officers, firefighters and paramedics to keep their eyes on the road. This natural positioning promotes a safe and comfortable workspace for emergency services officers spending 8-12 hours a day in their mobile office. Jotto Desk consoles are field proven, durable, reliable and in addition to being top rated, have flexible configurations to meet your individual needs. The Jotto Desk Police, Fire and Ambulance mobile laptop tables are the premier vehicle laptop tables for emergency service cruisers, patrol cars, truck's, SUV's, van's, fire trucks, ambulances, fleets, service vehicles, county fleets, utilities, oilfield and other related fleet vehicle applications. The mobile Emergency Service Laptop Tables provide tactically safe work zones for your emergency service department's in vehicle laptop computer table needs. The Kodiak Docking Stations provide a quality mobile docking station for your in vehicle mobile docking station solution. Most popular Panasonic and Dell laptops covered. 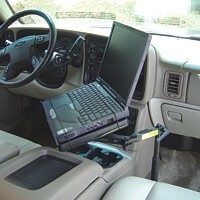 Jottodesk.net carries a full line of automobile laptop tables for all vehicles. Increase personal productivity with a truck table, car table, SUV table or van mobile laptop table... most of us have laptops so that we can take our business with us. 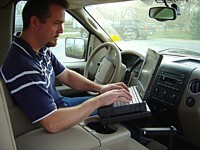 What better place to have a mobile lap top table than in your truck, suv, car, or van. Have you ever been on the road wishing you could just open your laptop for a few minutes to pull up a contact or a document? Could you do it when it was in the case in the backseat? Maybe, but not conveniently. Adding a notebook laptop table could solve the problem! Now, what if that laptop was on a table right beside you? 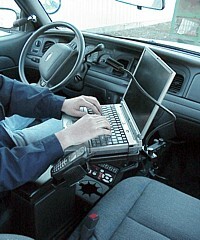 You pull over, lift the screen and your working with your contacts, all your information is right there. Need to enter some data, as you leave a sales call? With an automobile laptop table from Jotto Desk, it's a cinch. Now your laptop is helping you be more productive! We have a portable laptop table for any vehicle, including imports. These ergonomic laptop tables provide a solution for the individual or company looking for the mobile laptop table solution. Why wait - A 30 day money back Guarantee is provided with all notebook laptop table purchases! Your investment is minimal get all the productivity you wanted to have from the laptop you acquired. Most buyers of the laptop tables are deducting it as a business expense, further reducing the outlay, but think of the return. Could you increase your sales by even a few % each week having access to all your data quickly and efficiently? Could you perform more quotes, finish more jobs and projects, just with the time and energy saved by having your laptop handy and accessible? ---- Absolutely! Then order your laptop computer table today!!! !